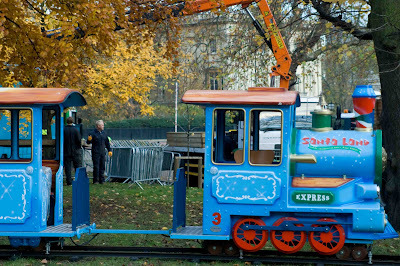 That convoy of trucks from yesterdays post were travelling through Hyde Park with everything needed to set up the christmas winter wonderland. Fun! The Christmas season is one of my favorite times of year! Ah-hah...it is that time of year. I'm such a coward. I wanted to guess that it was a carnival but didn't want to look dumb. Oh! I would never have guessed!!! Five weeks to go! Arghhh! These little trains are new to me. Like the digger at the back looks like it's scooping up the little train. I've pointed out on another blog that I think it's great that the rest of the world can decorate for Christmas so much earlier. Us Americans have to wait until the end of November (post Thanksgiving). I love that holiday, too, but it sure makes the Christmas season short!